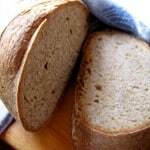 Home » Weight Watchers Recipes » WW Freestyle Recipes » Bread Recipes » Laurie Colwin’s Whole Wheat Bread Recipe for Weight Watchers Who Love Bread! Homemade wholewheat bread is so much better than anything you can buy at the grocery store, but it can be intimidating to make. That’s where this simple recipe for homemade whole wheat bread from Laurie Colwin comes to the rescue. In her essay, “Bread Baking Without Agony,” which appears in her wonderful book, Home Cooking: A Writer in the Kitchen, she describes an easy foolproof method for making whole wheat bread. I have it made several times with great results, a feat that still delights me. The key is using just a tiny bit of yeast so the dough rises slowly and can be adjusted to your schedule. As a Weight Watcher who loves baking and loves GOOD bread, I think a slice of this delicious hearty whole wheat bread is so worth its 2 PointsPlus value. Every time I eat homemade bread I ask myself why I don’t make it more often and give a little silent salute to my Nana, who worked full time while raising 2 kids and still managed to make time to bake bread from scratch every Saturday. If you like this recipe for whole bread, be sure to check out some of my other easy, healthy Weight Watchers friendly bread recipes including Slow Cooker Whole Wheat Bread, Moist Banana Bread, Cranberry Orange Oatmeal Bread, Quick Flatbread Dough and Lemon Rosemary Blueberry Bread. 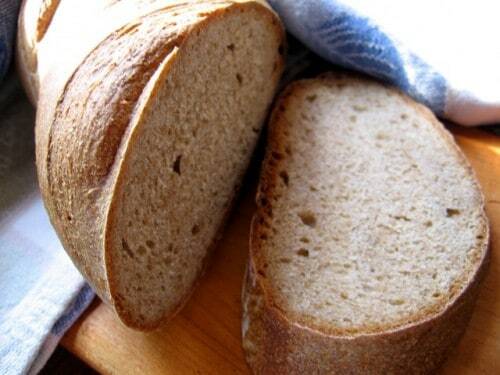 A dense, yet light, loaf of whole wheat bread that is so much better than anything you can buy at the grocery store! In a large bowl combine the flours, wheat germ, salt and yeast. Pour the water and milk into the flour and stir it up. The dough should be neither dry nor sticky but should tend more toward sticky than dry. If too sticky, knead in a little more flour. Roll the dough in flour and put it int a warm bowl. Cover it with plastic wrap or a clean towel and leave it in a cool, draft-free place and go about your business. Several hours later, whenever convenient, punch down the down, knead it well, roll it in flour and forget about it till convenient. Sometime later, punch the dough down, give it a final kneading, shape it into a baguette, place it on a baking sheet, slash the top with 4 diagonal cuts, brush the loaf with water and let proof for a few minutes (and if you don't have time, it can go straight into the oven). You can preheat the oven or put it straight into a cold oven, it matters not a bit. Bake at 450F degrees for 30 minutes. Turn the oven to 425F degrees and bake another 20 minutes. Interested in learning how to make Artisan Bread in 5 minutes a day??? Hi, would it affect this recipe at all to add ground flax? I would like to up the fiber a bit. And would it affect the end result if I were to use a bread pan? Thanks! Adding ground flax may cause the bread to get more brown and cook more quickly. Though I’ve never tried baking it in a pan, I think it would work, though it would be less crusty. Hope this helps! Tried this recipe yesterday. I never seem to have good luck with bread. It is okay but never like the picture. I debated trying again but yesterday decided that it was a good day. I can’t believe how wonderful it turned out. I will be making this again. I might try the bread pan idea. Love it. Thanks for posting. So glad it worked for you, Jackie! Dear Laura… would this recipe work in a bread maker?